Ever since its launch, Apple's New Mac Pro 2013 Edition has completely blown up the Internet. In fact, Futurelooks made headlines around the world when we compared a spec for spec PC DIY build to the top end New Mac Pro 2013 edition and came up short. About $2000 short. Then we put PC DIY up against the entry level Mac Pro 2013 edition, and still came up about $1000 short. OEM Manufacturers like HP, Lenovo, and DELL, didn't have anything in their system configurators that could top this either. For the Mac and OS X users out there looking for a workstation, this seemed like a great value. However, one question remained: How upgradeable is Apple's highly modded PC? Like many sites, we speculated on our own. Then as new information came in, we took that into consideration, and revised our thoughts. But when it comes down to it, nothing beats a hands on tear down, and the ability to shove seemingly compatible parts in there to check for ourselves. It also doesn't help that we're mainly a PC DIY site telling Mac users about their Macs. So we went to one of the biggest companies offering DIY upgrades for Macs, Other World Computing (OWC), and talked to their biggest fanboy, and CEO of the company, Larry O'Connor. His company builds DIY hardware upgrades for the Mac ecosystem, and their company has torn apart the Mac Pro 2013 edition quite a bit lately, testing a whole slew of products they want to potentially bring to the market. We caught up with him at CES 2014, and he told us exactly what is and isn't upgradeable in the New Mac Pro 2013 edition, in this exclusive interview! If you're having problems viewing the video, you can watch it right here on our YouTube Channel. So there you have it folks! 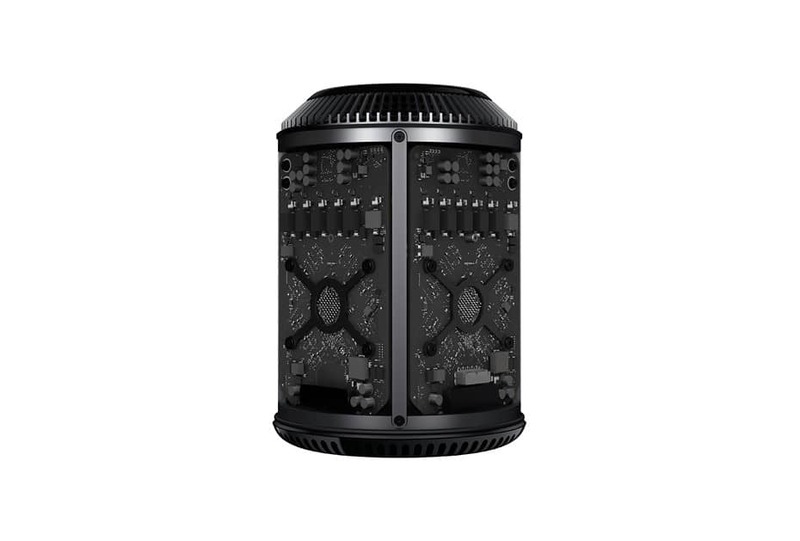 The word from one of Apple's biggest fans, and an authority on DIY upgrades for the Mac ecosystem, has spoken on what is and isn't upgradeable on the New Mac Pro 2013 edition. It's very interesting to hear about the CPU upgradeability being so open ended, and depending on how often Apple upgrades their GPUs, there could be a great secondary market for refurbished GPUs. Of course, RAM isn't even an issue, with kits coming out to support up to 128GBs. But the thing that did stand out at us was the inability for the Mac Pro 2013 edition to be fitted with a second Internal SSD, making it necessary to drag storage and peripherals along with Thunderbolt cables. Nonetheless, there is definitive proof that the DIY crowd within the OS X user population,who choose to upgrade to the latest form factor of Apple's flagship workstation, will have some upgrades available to them down the road, both as kits, and as a service, which is a substantial chunk of OWC's business. Last generation Apple Mac Pro users will also be happy to hear that OWC will take care of them with new PCI Express SSDs that will eclipse the performance of even the internal PCI Express SSD inside the Mac Pro 2013 edition. I'm sure that thanks to these types of products, along with the continued availability of more powerful plug and play GPU upgrades from the PC DIY space, last generation Mac Pro users will continue to use their machines till they give up. We'd like to thank Larry O'Connor of OWC (Other World Computing) for speaking to us PC DIY guys. It's great to see that despite what we perceive from a vocal few, that Mac DIY is alive and well and thriving. Larry would also like to let us know that most of their products are PC compatible too, so hopefully, we can give those products a shot in some upcoming reviews.